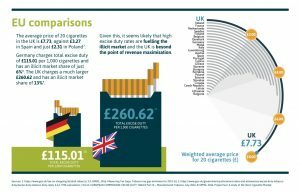 Germany charges total duty of £115.01 per 1,000 cigarettes and has an illicit market share of just 6% (2). The UK charges a much larger £260.62 and has an illicit market share of 13% (3). The following chart illustrates the change in the weighted average price of a pack of 20 cigarettes since 2012. Click on the image to view the scrolling price changes. The following chart illustrates the change in premium hand rolling tobacco prices since 2012. Click on the image to view the scrolling price changes.